Kid-targeted games have a bad reputation, but it’s not always deserved. Legend of the Guardians is one of those rare exceptions that stands on its own as a fun and visually arresting game for any age group, even if its simple premise and gameplay make it best suited to less-experienced gamers. As an accompaniment to the big-budget animated film hitting around the same time, the game provides an engaging counterpoint tale, and handles flight combat in a way that few other games have managed. The thing I like best about the owls of Ga’hoole is the way they handle. Unlike many other games that introduce winged creature flight, these characters move like real birds. There’s a sense of momentum from their wing beats, and a powerful feeling of inertia as you round a cliff or tree. The combat mechanic is mostly geared towards midair collisions and furious claw strikes, which has an excitement all its own. Admittedly, this dive and attack mechanic has limited appeal, and by the end of the game it feels a little tired. Even so, combat demands timing and target selection, and only occasionally resorts to throwing “missiles” that break the illusion of bird-on-bird throwdowns. A straightforward progression of missions dovetails nicely with the fiction presented in the movie and books. While the combat itself doesn’t offer much variety, the mission objectives do. Whether chasing down an escaping bird, fighting an evil bat queen, or protecting a flight of baby owls as they are brought home, the action changes up all the time. Bonus missions that unlock after completing an entire area act as good places to unlock extras and build up money. However, the armory system that allows you to upgrade your owl is pretty one-dimensional. Krome has done a fine job of translating this fantasy into the video game sphere. 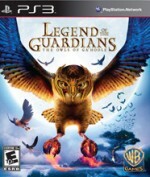 Legend of the Guardians sticks to a couple of core experiences and executes them well. You could do a lot worse than flying the skies protected by these stalwart owl defenders. 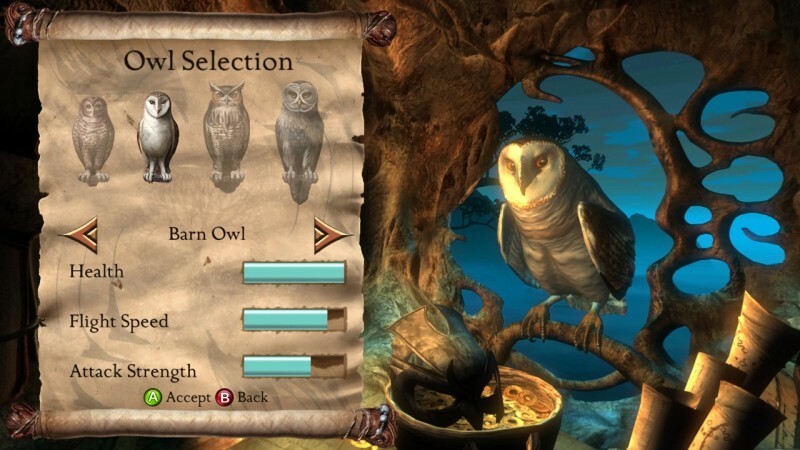 A simple but solid premise helps this owl-themed flight combat game maintain altitude.